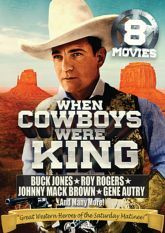 This special DVD collection features some of the most popular cowboy stars of the 1930s and 40s. Relive those wonderful days of yesteryear, when cowboys were the kings of the Saturday Matinees, with this spectacular set of eight classic westerns. Includes: Boss of Bullion City (Johnny Mack Brown, 1940), Feud of the West (Hoot Gibson, 1936), Pocatello Kid (Ken Maynard, 1931), The Lion's Den (Tim McCoy, 1936), Romance on the Range (Roy Rogers, 1942), Rootin' Tootin' Rhythm (Gene Autry, 1937), Tex Rides with the Boy Scouts (Tex Ritter, 1937), and Thrill Hunter (Buck Jones, 1933).